(AP Photo/J. Scott Applewhite, File) In this Feb. 5, 2019, file photo, Rep. Ilhan Omar, D-Minn., listens to President Donald Trump's State of the Union speech, at the Capitol in Washington. 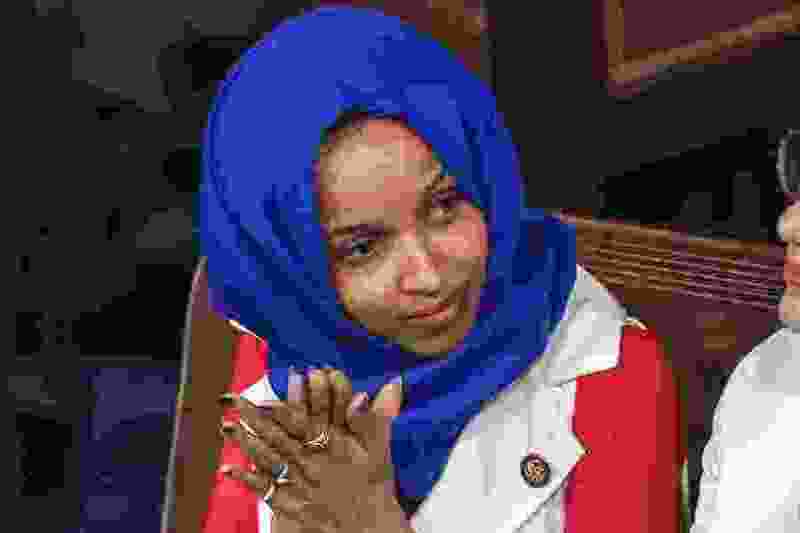 When the president of the United States goes after an American Muslim — in this case Rep. Ilhan Omar, D-Minn., who came to the United States as a Somali refugee — using images of the 9/11 attacks, it is cruel, frightening and dangerous in new ways. It is cruel because Trump essentially delivered his political rant while standing on desecrated graves. The images he employed not only included burning buildings but also burning human beings, drafted into a sad and sordid political ploy. Is nothing sacred to Trump? When said aloud, the question sounds like an absurdity. Trump has never given the slightest indication of propriety, respect or reverence. His narcissism leaves no room to honor other people or to honor other gods. Both the living and the dead matter only as servants to the cause of Trump himself. This cruelty extends to those who have fled war in Syria. President Barack Obama did little to serve their interests. Now, the victims of violence are treated as villains in Trump’s fictional version of global threats. Syrian refugees, according to Trump, are “trying to take over our children and convince them how wonderful ISIS is, and how wonderful Islam is.” On the strength of such calumnies, Trump has essentially destroyed America’s asylum system. This has led to a frightening state of affairs. By all the evidence, Trump is an anti-Muslim bigot. At one campaign event in 2015, a member of the audience stated, “We have a problem in this country, it’s called Muslims.” And he went on to ask, “When can we get rid of them?” Trump responded: “We’re going to be looking at that and plenty of other things.” Imagine a normal politician on the left or right being asked about the possibility of getting rid of all the Christians, or getting rid of all the Jews. They would likely use such a moment to clarify that they aren’t, in fact, insanely prejudiced monsters. Trump used such a moment to affirm the instinct of mass deportation and to promise a range of other anti-Muslim actions. The president claims to have seen “thousands and thousands” of American Muslims cheering on 9/11 when the towers fell — a lie and libel. He attacked a Muslim Gold Star mother, claiming that she “wasn’t allowed” to speak at the Democratic convention because of her faith — a lie and a libel. He has praised Gen. John Pershing for executing Muslim insurgents in the Philippines with bullets dipped in pig’s blood — a historical myth, but a revealing fantasy of anti-Muslim war crimes.